Finding a great craft brew shouldn’t be as hard as finding, say, a leprechaun, so Triple Voodoo is helping craft beer enthusiasts find stores and food and drinking establishments that serve Triple Voodoo’s specialty brews quickly and easily using the new beer locator on its website: triplevoodoobrewing.com. Inception Belgian Style Ale is bright and clear, so it quickly turns shamrock green by adding a drop of green food coloring. It’s probably no surprise that the holiday people most associate with beer drinking is St. Patrick’s Day. 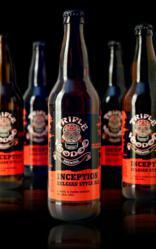 San Francisco craft brewer Triple Voodoo is making it easy for craft beer aficionados celebrate the holiday with its rare, special brews by using the website’s Beer Locator, available at the following link: http://www.triplevoodoobrewing.com/TripleVoodoo/faces/FindUs.xhtml. Triple Voodoo’s year-round brew, Inception Belgian Style Ale (8% ABV), is bright and clear, so it quickly turns shamrock green by just adding a drop of green food coloring. Its flavor profile contains a solid malty backbone and starts with sharp alcohol note, a twist of black currant in the center, and finishes clean. This unique profile was achieved using a special hop varietal, which makes it reminiscent of an IPA and gives it uniquely California characteristics. Craft brews are increasingly popular across the country. Gene Simmons, bass player for the rock band Kiss, just announced he is opening a rock-themed restaurant called Rock & Brews that will replicate the atmosphere of a rock concert and emphasize craft beer. For more information about the Triple Voodoo Beer Finder or any of Triple Voodoo Brewing’s products, please call (415) 390-2012 or visit them on the web at triplevoodoobrewing.com. Triple Voodoo Brewing is a San Francisco Bay Area craft brewery that is dedicated to three unwavering principles: a passion for creating the extraordinary, a desire to share those creations with the world, and an ultimate goal to help make the world a better place for everyone.